When I was growing up with my dog Jake, he followed me everywhere I went. He slept in the bed with me, he snuggled with me on the couch for Saturday morning cartoons, and he kept me company when I was sick and curled up in my parents’ bed. For me and Jake, there was nowhere in my house that was off limits. However, not everyone grew up this way. Many people don’t allow dogs on their furniture at all. Part of me understands why. As an adult, when you pay for all your own furniture, and you’re the one stuck vacuuming up all the hair and dirt that dogs can shed when they hang out, it starts to sound a little less crazy to keep them down. But personally, I could never do that with Janice and Leroy. Call me a sucker, but one mournful look from them is all it takes for me to invite them up to cuddle while we check out what’s new on the TV. If you are like me, and the idea of never letting your dog on the sofa or bed seems foreign, you may have already resigned yourself to never having “nice” furniture. But I’ve seen plenty of homes with clean, inviting décor where dogs are allowed to be a part of the family. The secret? Dog-proofing the furniture. It doesn’t take as much effort as you might think, and it can save your sanity and your dog’s happiness. Here are nine ways to dog-proof your home so that Fido can follow you everywhere. Probably the most popular method for dog-proofing your home is to cover your chairs and sofa with furniture covers. You can find covers that are made for standard couches, chairs, and loveseats, and while they may not fit your furniture exactly right, they’ll do a good enough job to keep hair and mess contained. This one by K&H is very similar to the one I use on my sofa, an older discontinued product. These are washable, very durable, and have a textured surface that captures hair and keeps it from floating around in the air or to the ground. If you are in the market for new furniture, you can proactively dog-proof your home by considering the material from your pet’s point of view. For example, furniture with wooden legs or accents may be a problem if your dog hasn’t been trained out of chewing yet. Leather and faux-leather are very popular for pet owners because they are easy to clean, and they aren’t porous – meaning hair and dirt won’t get trapped in a textured surface and stay stuck to your sofa or chair. Microfiber, that very smooth fabric that almost feels like petting an animal, is another very popular choice because it doesn’t hold on to odor very much, and it’s wet-repellent – perfect for a puppy still learning to go outside. Pet hair does cling to micro-fiber, though, so be sure to consider that when buying. Materials to avoid include silk or linen, which are very delicate and won’t stand up to nails; velvet, which grabs hair and hangs on to it; wicker and loosely plied carpeting, which are magnets for chewers; and anything tufted with buttons, which may tempt a puppy to pull on the buttons. I’ll be the first to admit that I’m not a style maven, but I think this is a pretty nifty idea. Have a black dog? Consider going with dark furniture rather than all-white pieces. Even though this isn’t really “dog proofing” your home, it is making it harder for visitors to spot the hair, and sometimes the appearance is all you need to stay sane while you battle the shedding. In the same vein as this tip, I’ve also heard that furniture with small-scale patterns (like tiny flowers instead of large, open geometric patterns) hides hair very well. Now you know! Besides, who wouldn’t want their house to look like their dog? Personally I think Janice and Leroy are beautiful, and any room inspired by them would be a cozy home. If you really hate the idea of your nice furniture being ruined by a smelly or shedding dog, but you also don’t want to banish your buddy to the floor, consider giving them a specific spot to claim. An older comfy chair, one end of the couch, or a huge fluffy rug at your feet, would all work well as your pet’s special place in the main living area. In your bedroom, consider putting their pet bed right next to yours to make them feel more at home, or even add a chair or small loveseat to your room for the dog if you need to. It’s much easier to get your dog to claim a specific spot if that spot smells like home. One good idea is to train your dog to associate a specific blanket with bedtime – then anywhere you put that blanket, they’ll curl up. I usually advocate pinching pennies and sticking to a budget. After all, that leaves more money for quality dog food and treats for Janice and Leroy. But there are some things that I truly believe one should splurge on. When it comes to the battle of the shedding coats, a vacuum cleaner that is specifically made for picking up pet hair is a lifesaver. This Dyson Animal Upright is worth the hefty price tag for many reasons. It actually seals to the floor with a suction action when it’s on, and it has brushes inside that stir up the hair. Even if you have a tightly-woven carpet that grabs hairballs and won’t let them go, this vacuum can take care of it. There are a few others like it on the market, but honestly I’ve never regretted this purchase once. If there’s just too much vacuuming to keep up with from multiple dogs, consider a robot vacuum to do part of the work for you. Another item that I believe in splurging on just a little is a quality dog bed. Janice and Leroy had gotten used to sleeping in my bed, until I decided that I wanted a little more legroom. Now they have their own beds that are nicer than mine. 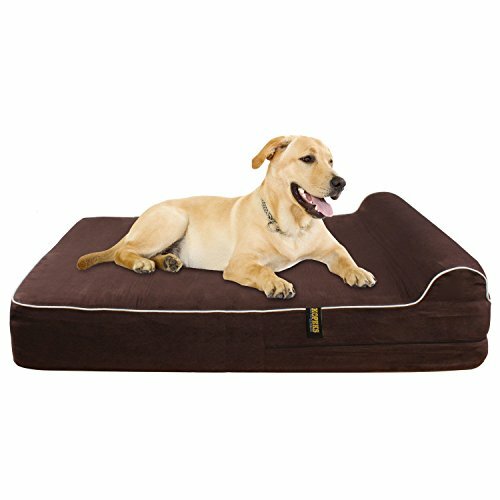 FurHaven’s orthopedic bed is a good choice for sticking to a budget, but there are many pet beds out there with memory foam, cooling gel, and other fancy features to make your pet love their spot. This is handy because pet beds can be moved, so it’s easy to keep them in their spot in the living room or the bedroom. they are bed hogs, so something like this Kopeks memory foam bed works great for them. 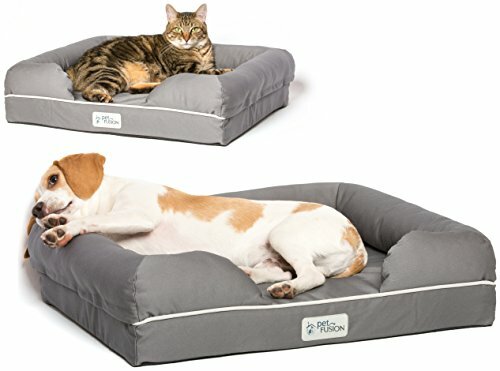 Smaller dogs often like beds that make them feel as though they are cuddled up in a cozy hole, so something like the PetFusion small bed (again with memory foam) is a good choice. The theory is that if your dog loves their bed because it’s the most comfortable spot in the house, they won’t be tempted to jump on the furniture. Dogs shed for many reasons, but the problem isn’t that they shed – it’s that their loose hair has nowhere to go except “off”. If you stay on top of regular bathing, brushing, and trimming, you’ll take care of that loose hair so that it goes where you put it. Then there’s nothing to fall off on your furniture – or at least, a lot less. If your dog is a big shedder, consider looking into shampoo and other hair care products that are specifically made to eliminate shedding. One of the best tools that any dog owner can have is a “dog rake”. 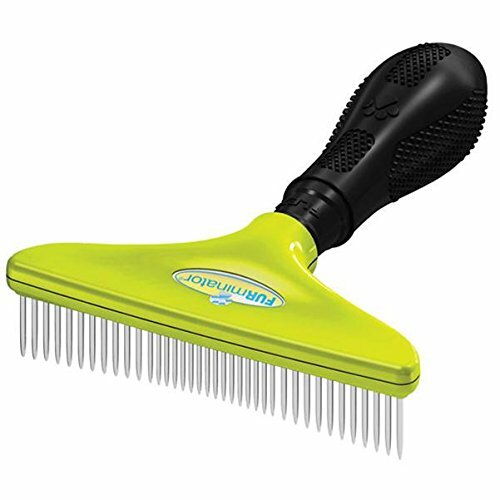 The FURminator is the best-selling rake I’ve ever seen, and for good reason. It does a great job untangling hair and getting rid of loose hair, and the company sells a variety of sizes for different coat lengths. You can get rid of mats without a lot of tugging because of the way this rake’s edges are rounded. And unlike a lot of the dog rakes you’ll find at chain supermarkets, this one has a slightly curved edge so that it follows the shape of a dog’s body better. You’ll also want to keep up with nail clipping to reduce the chance of tears in your sofa. If you aren’t comfortable with clippers, take it slow and have a styptic pencil or some styptic powder on hand in case of any bleeding. A professional groomer can help you keep your dog’s nails in check if you prefer that route. 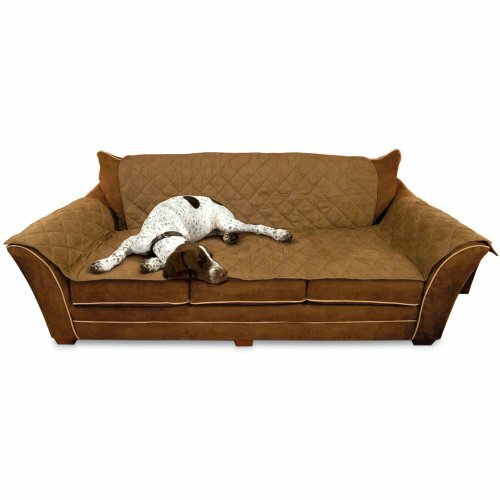 If you just can’t stand the idea of keeping your pet off furniture, can you stomach the idea of keeping them out of certain areas altogether? For example, make it a rule that your dog must always enter and exit the house through the back entrance, so that the front entrance stays clean and neat. Consider blocking off your office, or your dining room, but allowing your dog in the bedroom or living room. These are just examples, and of course, you should choose the rooms that make sense for your lifestyle. If you entertain often, you may want to keep your dog in the bedroom and office, while keeping the living room and dining room off limits. One nice thing about having a specific entrance for your dog is that you can set up a muddy paws station with everything you need for a quick clean. Some dog owners have Pinterest-worthy mud rooms for just that reason. My muddy paws station is just the backdoor leading into the kitchen – at least the tile is easy to clean, right? But if you want to go all out, by all means! While you can go out of your way to create a house that is dog proof and comfortable for your whole family, furry friends included, sometimes the little things work the best. Give your dog plenty of toys to keep them too occupied for a lot of lounging around on your couch. Keep a lint roller handy for when company is coming. Take plenty of walks so that your dog is spending less time indoors. Make sure they are healthy so their coat is strong and not shedding too much. Also, take a look at a few other tips I have for cleaning dog hair off of just about anything. You may find that one specific tip that does the trick, and makes your home as clean and comfortable as you need it. As for any smells, Febreze or any other freshener works just fine in my opinion. Try tucking some dryer sheets in the crevices of your sofa or chairs to combat heavy smells. These nine tips can help you create dog-proof furniture that works for your lifestyle. Whether you want to keep your pet up on the sofa with you, or you’d rather work on weaning them off to their own spot, know that your dog just wants to be present with you. Once they are used to the new arrangement, they’ll be perfectly content so long as they can be in the same room with the human they love.